Looking for home for them - free! 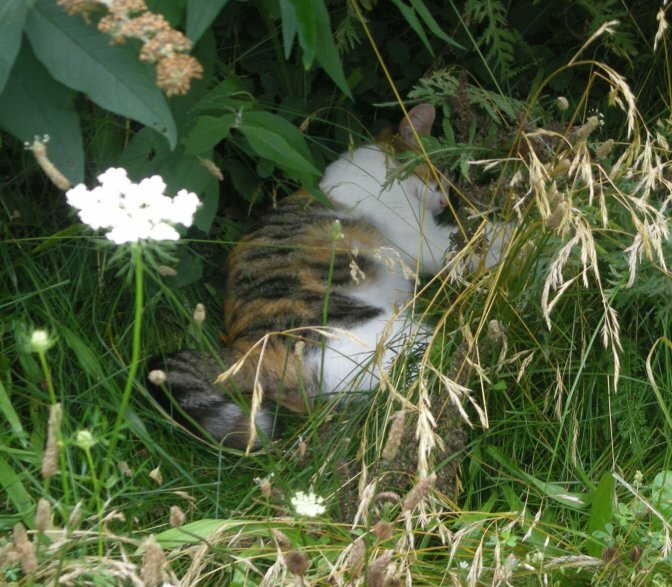 Early in 2010, on a very hot day, the local cat that loves to talk to you after feeding it a few times, is fast asleep under one of my Butterfly Bushes. Before she had her kittens. Aug. 24, 2010 - a neighbour came and said needed help, a cat had, had a litter in his backyard under a Butterfly Bush and in other flowers too. She looks very stressed out. Gathered them up and if you count - 5 of them. About 11:00 that same night, the same neighbour came back saying he could hear a cat meowing but couldn't find it in his backyard. Over we go and low and behold one more kitten was under the tall grass! Neighbours drop by to help. Aug. 28, eyes still closed. Aug. 31, eyes just start to open. A family came over to do a Monarch Butterfly release and got look at kittens to! Sept. 2, 2010 - time for a close up, check out the colours on the tail. Monarch Butterflies and kitten - how can you go wrong with this cute overload? Maybe, when the models don't quite pose right. - I am cute enough! Again, Miss Meow in the Butterfly Bush. and Miss Meow does her duty to an every growing family. With eyes wide open and legs that can walk, they have taken to climbing out and exploring. Tried to put a piece of cardboard on top and Mon even helped to tried and keep a lid on them but the power of kittens is too much!